EMF | 14 March 2012 – Haileyesus Worku, a journalist at the ruling EPRDF-controlled national broadcaster Ethiopian Radio and Television Agency (ERTA) defected last week to seek asylum abroad. He was released last year after 15 months of jail from the notorious kality prison apparently on vague allegations. Haileyesus Worku is the 52 government journalists who fled the country due to persistent repression. “Government journalists, who refuse to obey the ruling party’s membership quest would face every castigator measure ranging from harassment to imprisonment,” says Tsegaye Tiku, another government journalist who fled last year. The Ethiopian Peoples’ Revolutionary Democratic Front (EPRDF) government enacted harsh legislation that criminalized coverage of vaguely defined “terrorist” activities, and used administrative restrictions, criminal prosecutions, and imprisonments to induce self-censorship. The government has also jammed many international broadcasters and websites like VOA, Deutsch Welle and ESAT. The Ethiopian government is wildly known for its brutality and outrages handling of both governmental and free press journalists. 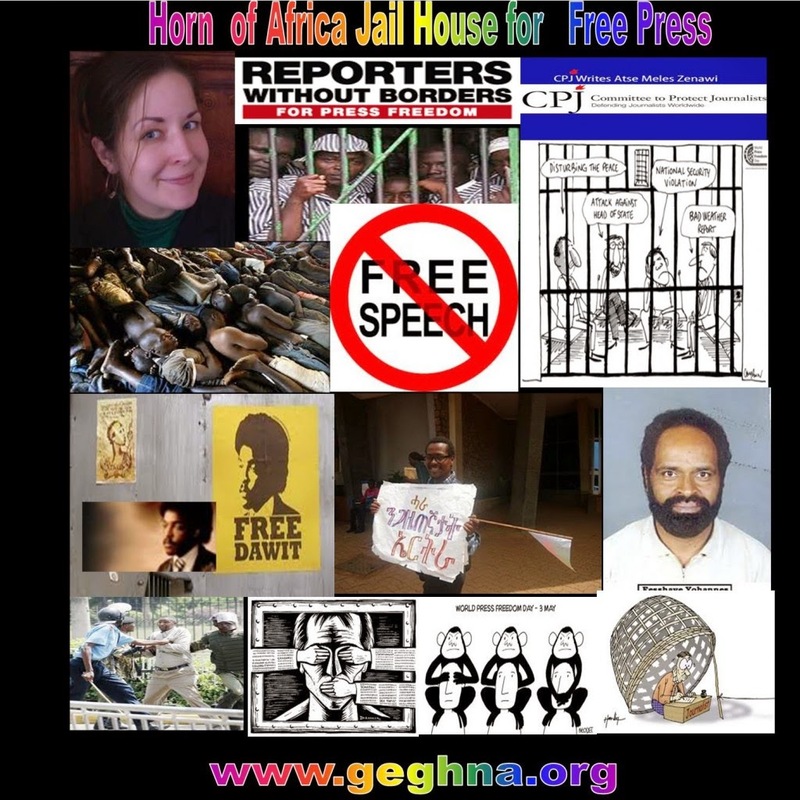 It is believed that more than a hundred free press and 50 government Ethiopian journalists are known to have been exiled in the last 4 years for fear of persecutions. Six prominent journalists have been held at Zenawi’s kality prison, facing terrorist charges. Journalists hold photographs of their colleagues who lost their lives in Syria recently, from left, Anthony Shadid, Remi Ochlik and Marie Colvin, outside the Syrian embassy in Ankara, Turkey, Feb. 24. The frightening crisis in Syria is a human catastrophe in the making, and it is one which the discredited Syrian government is trying frantically to hide from the world. Its deadly method is the targeting of international and local journalists, and it is having a devastating impact. But the despicable practice of rogue regimes such as Syria to cling to power by “shooting the messenger” is also beginning to change the way journalism is being practiced in conflict zones. In the first two months of this year, 13 journalists have been killed, including eight in Syria alone.Marie Colvin, an American with The Sunday Times of London, wore a distinctive black eye patch after losing the eye to shrapnel in Sri Lanka in 2001. She was killed Feb. 22 in Syria while reporting on the effects of the war on ordinary people. She died beside the young French photographer Remi Ochlik, who had just won a prestigious photo award for his work in Libya. A week prior, Anthony Shadid, the famed Middle East correspondent of The New York Times, collapsed and died from an asthma attack while reporting from Syria. In addition to these deaths, the non-profit organization, Reporters Without Borders, indicates that nearly 300 local journalists, citizen journalists, bloggers and media assistants have been imprisoned so far this year. Threats against the media are growing. Journalists are often seen as the “enemy,” and regimes are now using modern technology to trace and target them. The intensity of many current conflicts — where there is no longer a “frontline” — also further imperils the lives of reporters and their colleagues. War zone reporting in today’s world is more dangerous than it ever has been. While I was at the CBC, I worked as a journalist in several war zones — including Lebanon, Nicaragua, El Salvador and Mozambique. It was often dangerous but not as chaotic as it is now. Martin Bell, the former acclaimed war correspondent for the BBC, believes the aftermath of 9/11 was the turning point, when governments and combatants started to regard journalists as participants. Another important development now evident in Syria began during the Arab Spring. Spurred on by the popularity of social media, there has been an increasing number of bloggers, citizen journalists and activists providing pictures, video and text as a supplement to what professional news organizations are able to provide. This is beginning to dramatically reshape the nature of international news gathering. That was climaxed during the protests in Egypt which ultimately led to the resignation of Hosni Mubarak. At the height of the demonstrations, Mubarak tried to shut down Al Jazeera and stop the work of its journalists. That is when social media kicked in. Wael Ghonim, an Egyptian Google employee in Cairo, emerged as one of the key organizers of the protests. In his book, Revolution 2.0, he described how it happened: “Citizen journalism and social media played a great role in informing the world of the events in Tahrir Square… Hundreds of (web) pages, Facebook accounts and Twitter profiles were dedicated to disseminating the news”. The attacks on journalists by today’s rogue regimes will likely only increase in the future. More than ever, journalists are now seen as part of the action. But this new partnership between professional journalists and social media contributors is a promising counter-weight. A relationship which was once wary is becoming symbiotic and that can become a formidable challenge to regimes such as Syria’s. Tadias Magazine is located in New York City. This Magazine claims to be neutral of Ethiopian politics and focus on “non political affairs”. Yesterday it posted the news of Professor Mulugeta Kebede of Addis Ababa University of winning the 2012 Andrei Sakharov Award. On the comment page as always do asked the magazine or anyone to educate me on the Professor Mulugeta Kebede contribution to human right and freedom struggle in Ethiopia or for the rest of the world. The final respond I got from the Editor is accusing me of sending “nasty emails” which it failed to post for all to see. Because it has none! For the record in the last seven years of participating on Internet no one has accused me for sending “nasty emails”. Disagreeing with someones opinions is what democracy is all about and I have disagreed with many respectfully. Accusing me of “harassment” on Internet is another false accusations that showed the immaturity/ignorance or acting like “Rush Limbaugh”, throw words to scare people. Let me tell you let alone “ZembeBelu Magazine” nothing will scare me in life. What scares me the most are people who do not stand for any principle, “YeHode Magazines or Websites”. Warning to block opinions and information is just like deliberately unwire Ethiopia currently 0.1 percent or Jamming radios/TVs by the criminal regime of Meles Zenawi. However, here in the wired world no one will succeed in blocking opinions and I am ready to wage a protracted battle for freedom to speak and write. We are not in Ethiopia the Capital of “ZemeBelu”. ZemeBelu Magazine has no place in a democratic world. Tadias Magazine has a right to be different from most of the Diaspora Websites but has to be challenged when it turns to ZemeBelu Magazine.